With age and also due to life style choices like smoking, lack of exercise, and eating a diet with a high content of saturated fats and cholesterol, a build up can be deposited on the inside of the artery wall. This build up is called plaque and consists of cholesterol, calcium and fibrous tissue. It also contains white blood cells that cause an inflammation at the site of the plaque build up. Other risk factors for this condition are a family history of carotid artery disease, diabetes, obesity, and high blood pressure. While only 1% of people between the age of 50 and 59 have a significant amount of plaque in their carotid arteries, 10% of people in the age group between 80 and 89 years suffer from this condition. The plaque can become so big that it restricts the blood flow to the brain. This condition is called carotid artery disease. It can lead to strokes by at least to different mechanisms. First the irregular surface of the plaque and the inflammatory cells that are present in the plaque can make it look to the body’s defense systems like an injury that requires blood clotting to stop bleeding. Platelets called blood cells that usually form a clot in an open wound to stop bleeding can aggregate in the plaque and completely block the carotid artery, thus severely restricting or entirely stopping the blood flow to the brain. This is called a stroke. 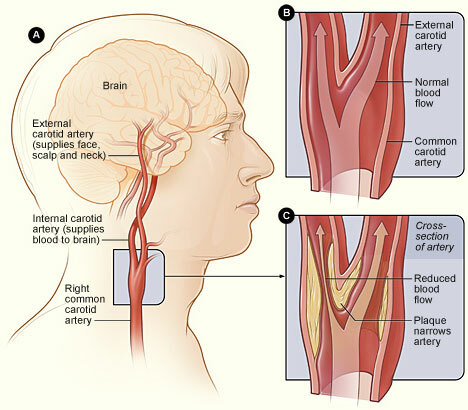 There is another way in which carotid artery disease can cause stroke. This is actually the more common way: the plaque is a fragile structure and a small piece can easily break off from it at any time. This piece of dislodged plaque can be transported further up in the artery and block a smaller vessel inside the brain cutting of the circulation to this area. Carotid artery disease often does not cause any symptoms, especially in its early stages. If your doctor suspects that you have carotid artery disease he or she might listen to the sounds of the blood flow in the carotid arteries by holding stethoscope to your neck. The plaque that causes carotid artery disease also makes the blood flow around it in a turbulent fashion, which produces a sound called carotid bruit. The physician can then order further tests like computer tomography (CT) scan, ultrasound, magnetic resonance imaging (MRI), or an angiography to confirm the presence and see the extend of the stenosis (clog or narrowing) in the carotid artery. Sometimes the first sign of carotid artery disease is a stroke. However, some people whose blood flow to the brain is disturbed by the stenosis in their artery experience temporary symptoms of restricted blood flow to the brain. This condition is called a temporary ischemic attack (TIA). The symptoms can be very similar to the symptoms of a stroke, but last only a few minutes to an hour. They can be slurring of speech, loss of vision in one eye, weakness, numbness, or tingling on one side of the body, paralysis in an arm or leg, or on one side of the face. Pounding noise in right ear when exercising? Pounding noise in right ear with exercise? Is carotid artery narrowing a common procedure? Comments and reviews on article "Carotid Artery Disease: Stenosis Symptoms and Treatments"